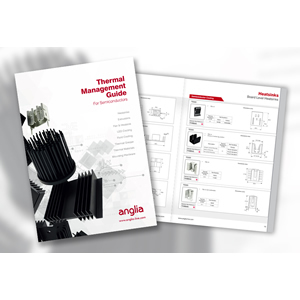 Anglia has published a new and comprehensive Thermal Management Guide, providing full details of the broad range of solutions it offers from industry leaders including Aavid Thermalloy, Fischer Elektronik, Calinar, Bergquist, Ohmite and Panasonic. David Pearson, Technical Director of Anglia, said, "Thermal management is an increasing challenge for designers. Reducing size of electronics both increases the concentration of heat and makes it harder to find space for heat sinks and other standard heat dissipation solutions. Technologies such as the increasingly high power LEDs and IGBTs have their own specific challenges. Designers aren’t always aware of just how wide the range of solutions available is so our intention is to provide them with an all-inclusive guide." The 56 page Guide is offered in digital and paper form, and provides an overview of the extensive range of semiconductor heatsinks and thermal interface materials available from Anglia. It details products from world leaders in thermal management and includes standard and extruded heatsinks as well as dedicated solutions for LED cooling and high power IGBT module applications. It features a website reference code for each product range which when inputted into the search bar on www.anglia-live.com allows quick access to live inventory, pricing and datasheet information. Anglia is supporting its thermal management product range with extensive UK inventory and competitive volume pricing. Some popular solutions are covered by the Anglia EZYsample free sampling service. All in stock products can be shipped the same day for free next day delivery. Anglia stocks over 800 million components from over 800,000 product lines in the UK. Components from every supplier are stocked in depth and breadth for same-day dispatch. Anglia aims to streamline logistics and reduce customers' transaction costs through services that include KAN-BAN, EDI, and customer-dedicated inventory, while an accurate, on-time delivery performance is a vital goal for the company. Technical support spans a sampling service that delivers over Â£150,000 worth of free evaluation parts each year and expert technical advice from well-trained product specialists and face-to-face guidance from field applications engineers. Both commercially and technically, management of industry legislation and component obsolescence are recognised as areas of vital importance to customers.